An archive of presentations given at conferences from recent past years. Please click on the presentation title to read a full description and download the presentation file. How do you develop and communicate a risk identification and mitigation plan for vulnerabilities to facilities’ critical systems? This case study will review how to undertake a comprehensive assessment and risk mitigation study – spurred by a burst, frozen pipe that drove the review of 2.7 million square feet on three of the Boston VA’s major campuses. This session will provide a synopsis of the newest requirements for medical gas and vacuum systems in existing health care facilities, including an overview of the new Joint Commission Environment of Care standards and the specific Elements of Performance. Further, strategies for planning, implementation, and evaluation of your operation and management programs, including emergency preparedness, for these systems will be discussed, as well as examples of best practices and procedures. In this session, a panel of experts will discuss the unique challenges of USP 797 and 800 compliance. Erin Higgins, MS, CIH, CSP, Senior Scientist at Environmental Health & Engineering, Inc., will serve as moderator for this discussion. In her role at EHE, Erin provides hospitals with expert guidance to navigate and comply with complex USP 797 and 800 regulations and increase patient safety. The panel will include a wide range of perspectives, from facilities manager to architect to pharmacy services director. As the revisions to USP 797 and 800 are set to go into effect in December of this year, this topic is especially important in our industry today. Joint Commission has captured this requirement in a note to the LS.01.01.01 Life Safety Code SOC Standard, stating for all ambulatory surgery centers the SOC requirements apply regardless of the number of patients rendered incapable. The definition of surgery is broad and includes other invasive and diagnostic procedures involving anesthesia. The CMS Law has been around a long time, the emphasis on one patient rendered incapable is new and represents a change. It also represents a departure from NFPA 101 intent that is much more restrictive. Facility Designers and Managers often ask; what are the design differences between Business Occupancy and Ambulatory Health Care (AHC) and what would the impact be if we changed the design to meet AHC?. What is the impact to existing facilities if an AHJ orders the Occupancy Classification be changed to Ambulatory Health Care? And, what would be the required operational changes such as within the fire plan and fire drill requirements. Based on NFPA 101, 2012 Edition, this presentation answers those questions, item by item, and offers a one page summary chart. The 2018 FGI Guidelines – Are You Ready for Change? The FGI Guidelines for Design and Construction documents are the design standards most often employed by medical planners, designers, and owners of hospitals and outpatient facilities. Authorities having jurisdiction (AHJs) in 42 states enforce some edition of the Guidelines, but even states that haven’t officially adopted the documents often refer to them to help determine their own minimum standards. The States of Massachusetts, Connecticut and New York are considering the adoption of the 2018 edition. This session will highlight the key factors influencing the proposed changes in the draft 2018 Guidelines. Public input and understanding of the development process is imperative to the continued success of this series of documents vetted by the multidisciplinary Health Guidelines Revision Committee (HGRC). These changes include requirements for recovery spaces; imaging, procedure, and operating rooms; and satellite sterile processing spaces in hospitals and outpatient facilities. Learn how these and other revisions may affect the planning and design of new construction and major renovation projects. This session will also review the HGRC’s benefit/cost analysis. Far too many healthcare facilities have experienced firestopping issues after opening new construction areas during post occupancy regulatory inspections. Stamford Hospital had a goal to avoid this issue when constructing their new 12-story, 650,000 SF hospital that opened its doors in September of 2016. They elected to implement firestopping special inspections on the project utilizing ASTM E2174 and ASTM E2393 to ensure that they were getting what they paid for – listed and approved compliant firestopping assemblies. While Stamford elected to implement these standards on the project, they are now specifically required for all new construction projects by the building code in healthcare occupancies in all New England states except New Hampshire. The goal of this presentation is to help owners, facility managers, contractors, and designers become aware of this new inspection process and the potential significant implications it has on cost and schedule. Lessons learned and specific best practices will be identified that attendees can implement on their next project. ASTM 2174 and ASTM 2393 prescribe a new level of inspection not typically experienced in the construction industry. The inspection process outlined in the standards involves destructively inspecting or witnessing the installation of a percentage of the firestop assemblies. The inspectors are required to compare the installed firestopping to listed firestop assemblies or approved engineering judgments that the contractor has submitted on the project. The comparison to a listed assembly dissects all aspects of the firestop assembly to ensure it is consistent with the listing. This includes the wall or floor type, the details of the penetrating item(s), the firestop material utilized, and the amount of annular space. The inspection process has uncovered that a vast majority of firestop installations are not being performed to a listed assembly. Most installers were simply applying the same firestopping product at an unspecified thickness around all openings and penetrations. The challenges experienced on the Stamford Hospital project in implementing this process, while not uncommon, were still painful – several trades were not aware of the difference between a firestopping product and a firestopping assembly, submittals did not match actual installation details, engineering judgments were not obtained proactively, and coordination between trades that contributed to a single firestop assembly were not occurring. As construction evolved, Stamford Hospital worked in collaboration with the fire stop inspector and the construction manager to create and implement enhanced quality control procedures on site to improve knowledge and performance. The result was a project that was ultimately completed on schedule and firestopping installation that has passed inspections by the City of Stamford, CT Department of Public Health and Safety, and the Joint Commission without any citations relating to quality of firestopping installed. Also, the firestopping installations are well documented for future inspections and reference long past the tenure of the project personnel. This case study will be presented from multiple perspectives. Christopher Lynch of Code Red Consultants will speak from the inspector’s point of view and will provide an overview of the firestopping requirements contained in the building code, outline what an approved firestopping assembly actually is, and the process for special inspection outlined in the ASTM standards. Michael Smeriglio and Stan Hunter will speak from the owner’s perspective on administration and management process to successfully integrate this role in the construction process. The presenters have collaborated to provide a detailed and specific list of best practices and actions that were derived out of their experience to share with the audience. Managing barriers in today’s healthcare facility can be a real challenge. There is a multitude of processes related to barriers and in any given week, a variety of trades and hospital personnel come in contact with them. In many cases the approach to handling compliance issues is reactive. This approach is costly and really doesn’t provide a true compilation of work being performed. Getting contractors back to make repairs after the fact is difficult, often leaving the facility to repair these infractions themselves. Improper penetrations in barriers continue to be one of the top 10 citations by inspection professionals. While code requires anyone penetrating a barrier to seal them to a specific standard, this is often incomplete, disregarded or misunderstood by those doing the installations. Maintaining the eSOC and PFI’s can be costly. So how do healthcare facilities get a handle on this perpetual nightmare? Taking a proactive approach to managing, documenting and inspecting barriers within a facility is best managed by utilizing a proactive approach. Implementing a standard from the conception of design. In order to implement a protocol for managing vendors, you need a process that includes task such as a permitting program. The process should document all barriers and penetrations, and ensure quality control throughout closeout inspection. The protocol should have an accurate, up to date accounting of who, what, when, where and how installations, maintenance and inspections in each barrier are performed. Exact locations of these applications are documented, providing the facility with a roadmap moving forward. With tightened budgets, increased regulatory requirements, and reduced staffing, maintaining these barriers by implementing a barrier management protocol saves time, money and resources. Reducing healthcare associated infections (HAIs) is of paramount importance in the operation of a hospital. Research has shown that the likelihood of readmission is greater for patients who experience HAIs compared to those that experience no adverse events. Annually, 1 in 5 Medicare beneficiaries is readmitted within 30 days of discharge, costing $26 billion per year with $17 billion of that considered avoidable. The Centers for Medicare & Medicaid Services has instituted payment-related policies which reduces payments to hospitals with excess readmissions. Readmissions of patients ultimately cost healthcare providers out of their own pockets, decreasing capital available for vital patient services and infrastructure needs. This presentation will include recommendations, insights, best practices, and examples illustrating how smart infrastructure investments can help to reduce avoidable patient readmissions and ultimately improve the overall finances of a healthcare organization and the health and safety of their patients, providers and visitors. Topics include air handling and sterile fields, air infiltration and disinfection, design and management of sterile spaces, water treatment, and improved patient healing environments. The goal is to highlight where facility management can go beyond the code and standard practices and focus on transforming the existing paradigm of health care facilities infrastructure design to improve patient treatment, care and general wellbeing. Energy Consumption has a direct impact on operating budgets for healthcare facilities. That impact translates directly to resources and patient care. In my presentation, I will provide an overview of energy saving tips, tactics, and case studies that are utilized across the nation. Attendees will gain a better understanding of current strategies hospitals are using to improve patient care through saving energy. Edward J. Stewart – Registered Roof Consulant, Gale Associates, Inc.
Christopher M. Foley – MCP, Gale Associates, Inc. Investigating and evaluating the building enclosure can be challenging due to access issues. Closely observing multi-story buildings, steep sloped roofs, steeples, and spires can be very difficult, and has often necessitated the use of lifts, swing staging, rope access, etc. These methods of exterior enclosure access can be disruptive to the occupant, time consuming, and expensive. An alternative to the traditional methods of “hands on inspections” is the use of aerial drones. A systematic visual survey of steep sloped roofs or facades can provide sufficient information as to the condition of these components including, but not limited to, the quantity, type, and locations of façade deficiencies. For instance, a drone survey of a slate roof can give almost the same information as a “hands on” inspection off a man-lift at a fraction of the costs. Zoom in capabilities can provide information on the condition of mortar joints, extent of masonry spalls or cracking, condition of sealants, and even the extent of masonry displacement. The Federal Aviation Administration (FAA) has recently adopted procedures and certifications for use of Unmanned Aircraft Systems (UASs)/Drones for hobby and business use. (UAS)/Drones can capture real-time, high-resolution video and photographs, and reduce the time and money it takes to perform a typical evaluation. Drones can quickly elevate and fly to the highest edges of a building in a matter of seconds. The ability to view these heights from the safety of the ground is a huge advantage for the observer. This presentation will detail the pros and cons of drone use on facilities, privacy issues, and FAA Regulations. The presentation will also include sample videos and images. Kristin Pitocco, M.P.H. – Environmental Health & Engineering, Inc.
It’s 2018 and corridor clutter remains a frustration for hospitals. It’s always on the radar for Joint Commission surveyors – annually appearing as one of the top cited Life Safety standards. In hospitals across the country many initiatives are launched to clear the clutter but frequently fall short of solving the problem. The fact is unless facilities management has the support of senior leadership their success will be significantly limited. Lahey Hospital and Medical Center leadership rolled up their sleeves to help facilities tackle this critical safety issue, resulting in clutter-free corridors – and some other unexpected benefits too. The common scenario is that facility managers and safety officers set out to fix corridor clutter problems and end up appearing as the enemy, always nagging nursing staff to move their equipment. At Lahey, when senior leadership stepped in to support facilities it sent a positive message. It clearly showed that this was an organization priority and communicated the urgency in resolving the issue to ensure patient, staff and visitor safety. Not surprisingly, medical equipment, beds, stretchers and workstations on wheels were the big contributors to clutter. Lahey’s Safety department in conjunction with Nursing Leadership interviewed nursing staff and found that there were multiple reasons that these items remained in the corridor. In some cases, storage spaces were too far away, other times, they simply didn’t know where to store the equipment (either due to lack of space or knowledge). In partnership with the leadership on the units, Lahey’s facility management team identified options for storage, and helped to reclaim storage space that had previously been converted to a different use. Senior leadership was instrumental in conducting daily rounding in all units and departments, spotting and reporting problems, and most importantly, driving home the importance of the issue. These daily rounds proved invaluable. It opened the lines of communication between nursing, the front line of patient care, and leadership. The nursing staff appreciated senior leadership taking the time to understand their issues and expressed that they felt that the leaders were a part of the team to address the issue, and not just expecting them to fix the problem on their own. The visible commitment from leadership to help greatly increased all colleagues’ engagement on the matter. Patient transport serves as a “hotline” for moving clutter to its proper storage location. Continued periodic tours of corridors by leadership maintains visibility and keeps the lines of communication open. Storage requirements are incorporated into all renovation and new construction projects. Monthly briefings with representatives from nursing help address any new issues. In this session, Acentech will discuss some of the challenges faced by the need to relocate the Brigham and Women’s Hospital (BWH)’s emergency rooftop helipad, including the potential inadvertent disruption to patients and clinicians inside their healthcare facilities. Through the analysis of existing conditions near and directly below the institution’s Center for Women and Newborns existing helipad, researchers at Acentech were able to generate an understanding for how future sites can mitigate disturbances caused by this life-saving route to bring patients to receive critical care. It is understandably difficult to allocate resources to developing building design that are amenable to inaudible helicopter noise transmission. A delicate balance of feasibility, perception of noise and vibration, and cost can help set realistic noise goals for an issue of this magnitude. Attendees of this session will learn how the impact generated from a helicopter comes from more than the vehicle’s engine and the whirring of propeller blades—the intense, pulsating air pressure generated from helicopters also contributes to structureborne noise and vibration concerns for hospitals. In turn, attendees will also learn what can be done to evaluate and mitigate this common problem within the modern world of patient care. Renovations of healthcare programs are challenging, the renovation of a hospital-based International Standards Organization (ISO)- classified pharmacy is in a class all by itself. With the December 1, 2019 deadline looming for healthcare institutions to be in compliance with the United States Pharmacopeia (USP) 797 and USP 800, developing a plan to renovate your pharmacy while maintaining compounding activities is essential. This presentation will review the pharmacy renovation strategies available to the healthcare project team and examine pharmacy case studies from Dana-Farber Cancer Institute’s (DFCI) experience renovating their cancer care facilities. Construction of a temporary pharmacy for use while the main campus pharmacy is renovated. Use of a temporary pharmacy trailer while a satellite pharmacy is renovated. Construction of a new, permanent pharmacy while the existing pharmacy remains open. Due to the need to maintain strict sterile environment within the compounding pharmacies, renovation in place is not always an option. When a temporary pharmacy is created on the premises of a healthcare facility it must meet all the same regulatory requirements as the permanent pharmacy. Temporary pharmacies can be very costly as you are spending double the amount of money by building “two pharmacies”. Along with the cost of construction, there are also many operational costs & factors to consider including staffing, maintaining appropriate security, timely deliveries of pharmaceuticals, drug transport, and maintaining operations from 2 locations. This session will give you an inside look at the intricacies of the 3 pharmacy renovation strategies employed at DFCI, regulatory submissions and USP 797 and USP 800 compliance. We will explore the project process for each type of pharmacy option, including the development of a comprehensive team, gap analysis, risk assessment, evaluation process, operational workflow, and the planning/design phases. And review the challenges that each pharmacy project faced; including the evaluation of space requirements and cost implications. 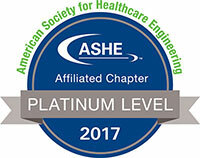 Michael A. Crowley, PE, FSFPE, FASHE, Jensen Hughes, Inc.
Life Safety Code and Building Code requirements have changed in the atrium smoke control design over the years. This presentation will describe the major atrium design criteria from previous NFPA 101 and Building Code. Prescriptive atrium designs were allowed in the past. The test of the old designs are significantly different than the current performance criteria. In 1988, an atrium would be designed to 4 or 6 air changes per hour based on the volume. In 2018, the atrium will be designed to maintain a smoke layer 6 ft. above the highest walking surface for the time to egress, or 20 minutes. This performance design is based on potential fire size and height of the smoke layer. Testing methods for the newer designs demonstrate performance of the system complies with the design calculations. Testing does not use any form of smoke or test gases. New and existing systems will be compared. The major concern of owners is the smoke control system status. Does it work as designed? We will discuss testing for retro commissioning, commissioning or testing. We have found the owner lacks the initial start-up testing and documentation. So retro commissioning may be needed to create the documentation trail for the atrium. Annual testing should be part of the fire alarm and detection system testing. Verification of fan starts and flow rates should be confirmed. The documentation and follow-up needed will be reviewed. This presentation will cover the key issues for smoke control commissioning testing and documentation. The presentation will discuss patients have the right to receive patient care in a safe setting. Hospital has an obligation to protect patients who are presenting with self-harm / suicidal ideation. The presentation will show a strategy to assess the physical environment for self-harm and ligature opportunities. The presentation will further discuss what does this mean to the facility manager and designer who takes on the responsibility to ensure the physical environment is appropriate for this patient population. The care and safety of psychiatric patients and the staff that provide that care are our primary concerns. Although the Centers for Medicare & Medicaid Services (CMS) is in the process of drafting comprehensive ligature risk interpretive guidance to provide direction and clarity for Regional offices (RO), State Survey Agencies (SAs), and accrediting organizations (AOs) the expectations for improving the physical environment is a required action now under the current published standards of care. These resources will also be explored as part of the presentation. The presentation will discuss that the ligature risk environment has been defined as anything which could be used to attach a cord, rope, or other material for the purpose of hanging or strangulation and that ligature points include shower rails, coat hooks, pipes, and radiators, bedsteads, window and door frames, ceiling fittings, handles, hinges and closures, etc. The focus for a ligature “resistant” or ligature “free” environment is primarily aimed at Psychiatric units/hospitals. However, hospital emergency departments and general medical units are under scrutiny as well when patients with self-harm ideation are cared for in these clinical settings as well. Many of the challenges facing designers and facility managers is understanding what types of building materials (exit signs, lighting, mechanical vents, etc.) are available to meet this required change to the physical environment. Understanding installation challenges and how best to approach the need to make these modifications to physical environment will be discussed. A proactive approach is encourage vs. waiting for the authorities having jurisdiction to identify deficiencies and elevating the hospital into a “risk to life status” requiring mitigation within 60 days or be placed in a condition of participation action plan. Presentation will discuss recent enforcement activities. Presented by: Engineering Planning and Management, Inc. This session will address how having a clear vision & desire to continuously learn creates a deliberate & strategic approach to unit planning & outcomes. We will share the learning framework and strategies that are positively impacting ongoing work at Brigham and Women’s Hospital. Recognize methods for analysis of current state and development of countermeasures as a means for making informed design decisions. Research the most current strategies for reducing Healthcare Associated Infections (HAI) in patient care environments. Assess techniques for reducing post-occupancy rework through technology adaptable solutions. Summarize the framework of a post occupancy review, identifying techniques for creating a continuous improvement of “Plan-Do-Check-Act”. This session will review requirements of the International Building Code, NFPA 101 2012 & 2018 and NFPA 101 2012 reference Codes and Standards using interactive polling. Identify NFPA 101®, Life Safety Code® and International Building Code requirements which are often overlooked in design of health care occupancies. Identify requirements of NFPA 101®, Life Safety Code® 2012 and International Building Code 2018 edition where the codes have different requirements related to health care. Identify requirements of NFPA 101®, Life Safety Code® 2015 and 2018 editions which can be used as justification for requesting equivalencies. Review Codes and Standards referenced by NFPA 101®, Life Safety Code® 2012 such as NFPA 10, NFPA 13, NFPA 72, NFPA 99. With siloed information systems, disjointed communications and limited budgets, the notion of increasingly strict compliance regulations looms over the future of healthcare. In this presentation, attendees will learn best practices for transforming the compliance process using digital tools and methodologies. Discover strategies and tools that reduce the amount of time and resources dedicated to compliance activities. Learn best practices for implementing new processes and tools into your organization. Achieve a simplified workflow for self-audits, accreditation audits, ongoing training, and more. Discover new, quantified trends related to information management in a healthcare setting. In this session, a thorough review of the code will be presented including actual cases where hospitals faced challenges understanding the code and achieving compliance. New projects and existing nonconforming conditions will both be reviewed. JACA will present recent project experiences and regulatory challenges including how compliance was obtained while Phil will provide an understanding of how to approach a project and offer the AHJ view on projects are considered when reviewed. Projects such as a multi-floor and building-phased renovation project at Beth Israel Deaconess Hospital, a fit-out project at BID Plymouth, and a building addition for a Hybrid Operating Room will be reviewed as case studies. Thorough understanding of how the separated approach to code compliance can save money. Clear and concise review of the new and expanded health care suite options now available to hospitals. Explanation and review of controversial changes in the new JC/CMS requirements. Review of changes related to hospital projects in NFPA 2012 including a question and answer segment for attendees.